One of the first Five Gallon Inventions I ever came up with was a river cooled 5 gallon bucket cooler. 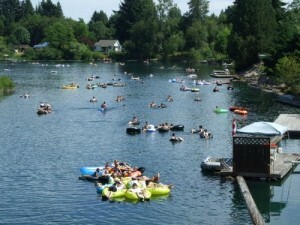 This is the Cowichan River, a world famous river tubing destination. At the mouth of the river sits the town of Lake Cowichan. Its economy is held up with tubing dollars. You can find rafts, tubes, drinks and coolers sold everywhere. When we tubed the Cowichan, we had bought at least a dozen adult beverages to enjoy on our lazy cruise, but we couldn’t find a cheap waterproof cooler to keep them in. Even the sad disposable Styrofoam ones were 15$ at the hardware store. That’s when we spotted a 5 gallon bucket for less than 5$ at the same hardware store. Since the bucket would be towing along behind us in the cool water, we didn’t even need to fill it up with any ice. It worked perfectly, and our five gallon idea was noticed all down the river. I like to think we started a trend that day! These are my favorite 5 gallon coolers because they stack and they are color coded. Unlike the sports cooler below, they are designed to hold bottles and cans – so they would have worked perfectly on our tubing adventure. – with space left for plenty of ice. 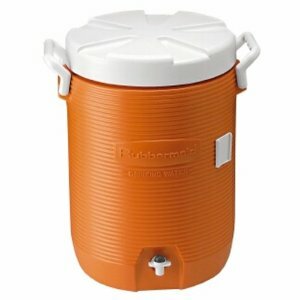 These stackable 5 gallon coolers are manufactured by Coleman. I’ve only seen them available online, but a camping store like REI would probably have something similar. We own one of these Rubbermaid insulated coolers as well. They’re not designed to hold bottles so this wouldn’t have worked on our tubing trip. These units hold straight liquid. Since it’s insulated, we use it when we need to keep a liquid either hot or cold for an hour or longer. A standard 5 gallon bucket alone won’t keep temperatures consistant that long. More specifically, we use this for brewing, during the mashing stage. Mashing is soaking beer grains in hot water which transforms starches into yeast-edible sugars. The mash stage takes an hour and needs to be held at exactly146F the entire time. We got our insulated liquid cooler on Amazon. I’ve also seen these at Home Depot and other hardware stores. I’m sure sports stores would carry them too. This is a cloth-based 5 gallon cooler. It holds 20 cans – the same as the stackable cooler, but it has a strap is can be hauled by shoulder like a laptop bag or purse. But unlike other bags, it’s insulated. This bag is from Picnic Time! They also have backpack coolers which I won’t go into here, but might on the 5 gallon backpack article. 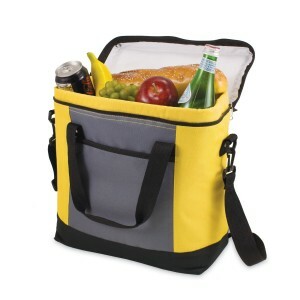 Check out Picnic Time’s Amazon store for more details about this and their other bag-based coolers. Black material just radiates heat better – whether that’s sunlight into the bucket or your hot liquid out of it. Whether you’re trying to keep the contents hot or cold, a white bucket will be better, as more ‘outside’ heat is reflected away or ‘inside’ heat reflected back inside. If you nest two buckets together, the airspace between them will provide insulation and allow the cold to last longer. And, you could use a colored bucket for the inner one for a touch of style or color coding. Nest a 3 gallon bucket in a 5 gallon bucket. Fill the space between with sand, and wet the sand so that it is damp but not dripping (maybe a screened drain hole in the 5 gallon would help to defend against overwetting the sand). The evaporation of water from the sand will cool the sand and, in turn, cool the inside of the 3 gallon bucket. Very neat technique – you can bet I will be trying this and measuring temperature differences! I tried this, didn’t work well because water can’t evaporate through the bucket surface. It was a really cool experiment though. Try drilling a few 1/8″ holes along the outside bucket. Enough to help create some outlets for the warm water vapor to escape. Yes that should certainly help. Need a way to prevent the sand from spilling out – maybe shade cloth. I have seen a similar design to that actually. Taking glass bottles on the water is very bad form. Cans or plastic only. And bring a container to take out your trash in, too.